Is Paraguay too much trouble? Property prices in Paraguay are among the lowest in South America but buyers must be cautious. Paraguay's corrupt legal system hinders the effective protection of property rights. There is no coherent national property survey or land register. Due to lack of jobs in the countryside and the commercialization of agriculture, peasant groups staged a series of land invasions in 2004. These occupations often resulted in the expropriation of owners' estates. The government subsequently validated peasant ownership. Theoretically the original owners should have been compensated, but this has rarely been done. There are no restrictions on the ownership of property by foreigners. They may also engage in commerce or industry without limitation. The capital city of Asuncion is the only place where property rights are secure enough to make it advisable to buy. Yields are low however. A 100 sq. m. apartment may cost only US$40,000, but it might rents for as little as US$70 per month. This would give the landlord a very low yield, at 2.1%. Houses in Asuncion tend to be worth around US$500 to US$600 per sq. m., and they rent for around US$1.50 to US$2.70 per sq. m. per month. Rental yields on houses are therefore around 3.5% to 6%. Rental Income: Rental income earned by nonresident individuals from Paraguayan real property is subject to 20% withholding tax levied on 50% of the gross rent (i.e. 10% withholding tax on the gross income). Leasing real property in Paraguay is also liable to VAT at the reduced rate of 5%. Capital Gains: Occasionalcapital gains realized by nonresidents from selling Paraguayan property are taxed at the standard withholding tax rate of 20% levied on 50% of the sales price (i.e. 10% withholding tax on the gross income). Inheritance: There are no wealth, inheritance, or gift taxes. 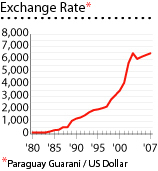 Residents: Residents are taxed on their Paraguayan-sourced income at a flat rate of 10%. The total round-trip transactions cost , i.e., the cost of buying and selling a property, is 6.765% to 8.24%, inclusive of the 5% real estate agent's fee. The rental market of Paraguay is in practice pro-tenant, not because of the law, but because of the inefficienvy of the court system. Rent: Although initial rents and rent increases can be agreed upon freely, it may take up to two years to collect unpaid rents. Tenant Eviction: It is also very difficult to evict tenants. Politics usually intervene with the corrupt and incompetent judicial system. Even after the end of president Alfredo Stroessner’s 35 year reign, his party, the National Republican Association-Colorado Party, continues to rule. However, factional splits caused the assassination of a vice-president and the resignation of the president in 1999. The same year, Senate President Luis Gonzalez Maachi was appointed caretaker president. An attempted coup against Maachi’s government was foiled in 2000. In 2002, he declared a state of emergency due to violent street protests. In 2002, he survived an impeachment attempt over charges which include corruption. After his term, Maachi was put on trial on corruption charges and barred from leaving the country. In August 2003, a new administration was inaugurated under President Nicanor Duarte Frutos, who has proposed major economic and political changes. His tasks are daunting. Annual GDP growth from 1996 to 2002 was only 0.18%, with economic contractions experienced in 1999, 2000 and 2002. GDP growth for 2005 was 3%. Real GDP per capita in 2005 at US$1,255, or still 12% below its 1981 level. Paraguay is a full member of the MERCOSUR together with Argentina, Brazil and Uruguay, the largest commercial area in South America. About 33% of the population lives below the poverty line. Inequality is among the most extreme in the world. Corruption is a fact of life. Paraguay has become a regional center for smuggling, money-laundering and organized crime.